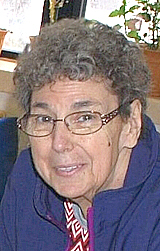 GIBBON — Phyllis Mae Marte, age 69, passed away Tuesday, Jan. 29, 2019 surrounded by her family at her daughter’s home in Gibbon. Mass of Christian Burial will be 11 a.m. Monday, Feb. 4, at the Cathedral of the Holy Trinity in New Ulm. Father Gerald Meidl will celebrate the Mass. Innichment will be held at the Catholic Cemetery in New Ulm at a later date. Visitation will be held from 8:30 to 10:30 a.m. Monday, Feb. 4, at the Minnesota Valley Funeral Home – NORTH CHAPEL in New Ulm. Phyllis is survived by her husband, Eugene Marte; children, Kevin Carey (Travis, Andrew, Ashley, Alex), Kristine (Craig) Schwab (Allie, Samantha, Marah, Chloe, Taber, Hunter; step-children, Peggy Marte (Ben, Ernest), Craig (Darlene) Marte, Mark Marte (Sierra, April, Whitney, Savannah), Kevin Marte (Christopher, Tony, Nicole), Bobbie Marte, Steven Marte; siblings, Eugene (Judy) Carey, Michael (Sue) Carey, Patrick Carey, Margaret Johnson, Joe (Judy) Marte, Sophia (Gene) Bartkey; sisters-in-law, Karen Carey, Myrna Carey; and many nieces, nephews, and other relatives. She was preceded in death by her parents, In-laws, Carl & Alberta Marte; step-sons, Steven, Bobbie, Kevin Marte; daughters-in-law, Kris Marte, Christine Carey; brothers, Leroy, Wayne, Joe, Gerald; sister, Roxanne; brother-in-law, Emery Johnson; and many other family and friends. Phyllis Mae Carey was born April 1, 1949 to LeRoy and Angeline (Steies) Carey in Eau Claire, Wisconsin. She graduated high school at Eau Claire Memorial in 1967 and began working at Norwesco Plastic Plant. She met and married Eugene Marte in 1974. Phyllis went on to work at Entegris, ADC Telecommunications, and owned Valley Ceramics in Henderson, Minnesota, until her retirement. In her free time, Phyllis loved going to casinos and spending hours at the slot machines. She was also a skilled craftswoman, hobbyist, and ceramic artist, often sharing her art as gifts for her family. Phyllis’s deepest passion was her grandchildren and great-grandchildren. Any time she was able to spend with them was always treasured the most. She will be dearly missed by all who knew her, blessed be her memory.